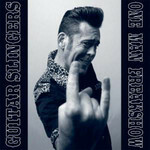 Under the name The Guitar Slingers, Klingonz guitarist Doyley delivers a Psychobilly masterpiece with One Man Freakshow. He is a fantastic songwriter, a guitar wizard and brilliant on many other instruments. With guest musician appearances from members of The Klingonz, Demented Are Go, Robin, Evil Devil, Spellbound and the Astro Zombies, this outstanding album is Psycho to the bone.